When an earthquake strikes, please remain calm and take the following action. It is important to be prepared at all times. If you notice a tremor, protect yourself by hiding under a sturdy table. After the tremor is over, check to see if there are any flames. Open a door or window to secure an exit. Do not rush outside in a panic as there may be falling objects. Be careful of falling items, such as glass and billboards. Stay away from block walls, vending machines, and other structures that may topple over or fall. If you are on public transportation, underground shopping arcade, or a department store, follow the instructions of the staff. If you are driving a car, pull over to the left side of the road. If you leave your car, leave the key in the ignition (in case the car needs to be moved to let emergency vehicles through). Gather correct information through the radio. Do not believe false rumors. Find out whether your family members are safe. Help people trapped under a building or those injured. Before you leave your house, turn off both the main gas valve and the breaker. Japan is an earthquake-prone country. Please prepare your home to prevent injuries and accidents in the event of a major earthquake. Live in an earthquake-resistant building. Secure furniture with braces so that they will not topple over (earthquake tremors can do more damage than expected). About 80 percent of the victims of the 1995 Great Hanshin Awaji earthquake were crushed to death because a building collapsed or furniture toppled over on them. 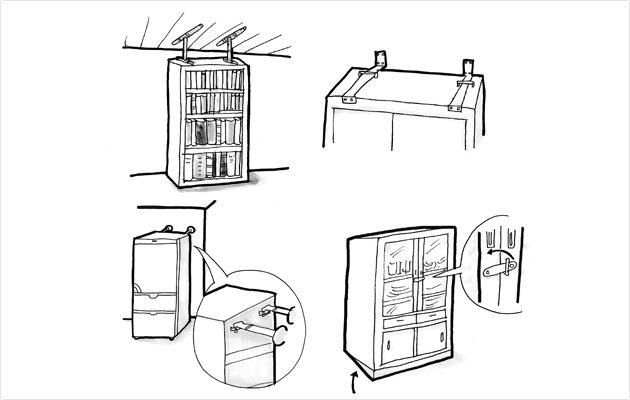 ◎The City Office offers coordinating services for furniture falling prevention equipment. For details, please read the catalogue distributed at the Security Affairs Division, Shinjuku Municipal Disaster Prevention Center and Branch Offices. The City Office also offers consultation and installation services for the equipment. Please ask the Security Affairs Division for more information. Houses built before 1981 when quake-proof standards were changed should undergo a quake-resistance examination to avoid the risk of collapse if a major earthquake strikes. If the examination concludes that your house is not quake-resistant, please strengthen pillars, walls, the substructure, etc. ◎The city subsidizes citizens for quake-resistance examinations and quake-resistance upgrading work, etc. Some block walls have a high risk of collapsing due to aging and faulty workmanship, so please have your block walls examined. Remove the wall if necessary. ◎The city subsidizes the cost when citizens remove block walls, etc. facing roads that are one meter or higher. There are also subsidies for residents who install fences, etc. to replace block walls, etc. ◎The city subsidizes the cost when citizens replace block walls, etc. facing roads by building hedges/planting strips. This includes the cost of removing the block walls, etc. If you live next to a cliff or a retaining wall, please check the following points to avoid an earthquake from triggering a landslide there. Does the cliff have a bulge? Are there cracks on the cliff? Have the rocks piled up to reinforce the cliff loosened and separated or moved from their original position? Do you notice mud water pouring out from between the rocks? Keep an emergency backpack handy with items necessary for daily life and a first-aid kit. We recommend that you refer to the following items when preparing an emergency backpack. Note: Don’t overstuff the backpack as you would have difficulty carrying it around. Three kilograms should be considered the maximum weight. Eyeglasses, toothbrushes, tissues, emergency toilets, etc. ◎As part of its disaster prevention goods coordinating service program, the City Office offers disaster prevention goods via mail order at reasonable rates through cooperative ties with designated companies. Catalogs showing these goods are available at Branch Offices, the Security Affairs Division, and the Municipal Disaster Prevention Center. Please apply directly with the designated dealers listed in the catalog. Discuss and decide on the following topics so that you won’t panic if a major earthquake strikes. The safest place in the house. Where to keep emergency backpacks. How to get in touch with family members outside the house and learn their current locations. This is a convenient voice-mail system you can use to get in touch with residents of disaster-struck areas and confirm their current locations. It can be used even when there is difficulty getting telephone calls through to a disaster-struck area. Dial 171 and follow the instructions to record or play a message. NTT determines when this service is available and such conditions as the maximum number of recorded messages, and the service will be announced via TV and radio. ▼A recording will give instructions. Press (03)×××× – ×××× ▼A recording will give instructions. Note: For details on disaster message services, please ask your cell phone company. Disaster prevention resident organizations to coordinate neighborhood activities when a disaster strikes are organized by community. It is a good idea to participate in the disaster prevention drills conducted by disaster prevention resident organizations, to be constantly prepared and to become familiar with the community disaster prevention system. DVDs and videos are available for rent as reference materials for spreading information on disaster prevention and preparing residents for disasters. Can You Survive! ?—A Major Earthquake Strikes Shinjuku (about 18 minutes) is a video on tips on how to prepare for earthquakes and is available in English, Chinese, and Korean. It can be rented at the Shinjuku Municipal Disaster Prevention Center. Shinjuku City presents a program of earthquake experiences using an earthquake experience car at disaster drills and local events. You can experience seismic intensity levels from a weak 5 up to 7. More use of the car at local anti-disaster drills will enable more people to experience what a major quake is like and help them learn how to behave appropriately in such a situation. A temporary gathering site is a place to stay temporarily to grasp the situation before going to evacuation sites and evacuation areas. Large parks and public squares are designated as evacuation areas so that you can protect yourself from fires when a major earthquake strikes. When the tremor stops, proceed to a temporary gathering site designated in advance by disaster prevention resident organizations, usually a nearby park or an empty space, to grasp the situation. If a large fire breaks out that threatens the safety of your residence and the nearby evacuation site, go to an evacuation area. If your residence or a nearby building collapses or burns, preventing you from returning home, go to an evacuation site (e.g. a school) and stay there. The seismic intensity of earthquakes and the effects that can be expected at each level are shown below. However, actual damage could be greater or less than described below, even though the seismic intensity may be the same as the figure listed. The actual effect depends on the buildings and ground condition of the area. In addition, the seismic intensity announced by the Meteorological Agency is the figure as measured by a seismograph. The figure does not represent the actual effects of a tremor. Most people will be startled. The majority of people will be afraid and will try to grab onto something. Dishes and books may fall from shelves. Furniture not fixed in place may move, and unstable items may fall. Walking without grabbing onto something will be difficult. Many dishes and books will fall from shelves. Furniture not fixed in place may topple over. Nonreinforced brick walls may collapse. It will be difficult to stand. Most furniture not fixed in place will move, and may fall over. Doors may become jammed shut. Windowpanes and wall tiles may crack and/or fall. Roof tiles on wooden buildings with low earthquake resistance may fall, and the buildings themselves may lean over or even collapse. It will be difficult to move forward without crawling. The tremors may throw you. Most furniture not fixed in place will move, and may topple over. Many wooden buildings with low earthquake resistance will lean over or collapse. Cracks/fissures may appear in the ground. There may be serious landslides, and mountains may even collapse. The majority of wooden buildings with low earthquake resistance will lean over or collapse. Although rare, even highly earthquake-resistant housing may lean to one side. Many concrete and steel buildings that have low earthquake resistance may collapse.